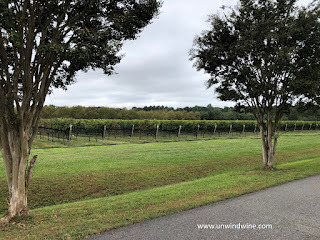 Returning from OBX, the Outer Banks, the North Carolina Atlantic barrier islands, we passed through Williamsburg,Virginia and visited Williamsburg Winery, one of the largest wine producers in the State. Williamsburg have about 40 acres of vineyards, designated the Wessex Hundred Vineyards, on the 300 acre Estate just outside Williamsburg. 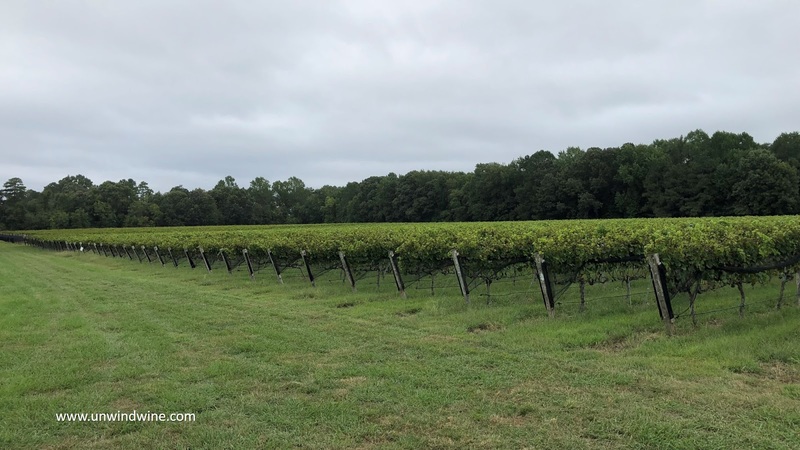 They also source grapes from numerous vineyards around the state of Virginia, and source some juice from the Central Valley in California. 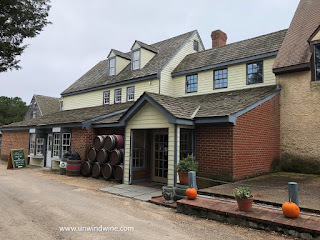 Williamsburg produces about two dozen labels, a complete line-up from light whites to full bodied Chardonnay, to a flight of full bodied reds and several dessert and 'specialty' wines. 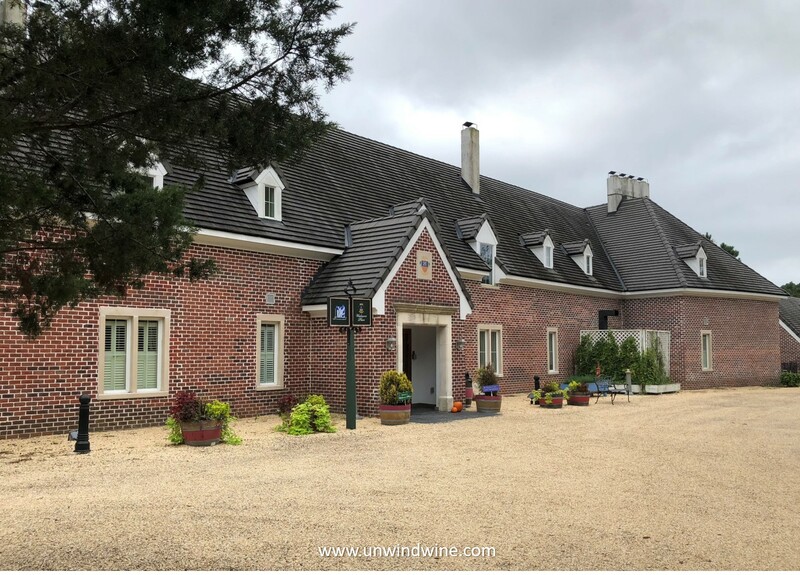 On the Estate they grow Bordeaux varietals, Merlot, Cabernet Franc, Petit Verdot and Malbec as well as a selection of white grape varietals; Viognier, Traminette, Alborino, Vidal Blanc and Chardonnay. They are replanting older vines and increasing their vineyard plantings on the expansive property. 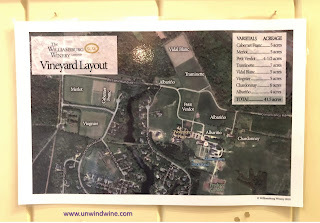 The Williamsburg Estate vineyards layout and compositions are shown in the image graphic. Williamsburg has an Estate Winery with tasting room, a Connoisseurs Club VIP center for Wine Club members, and an area for special events. Susan Constant, Discovery, and Godspeed ships that landed on the shores of Virginia in In 1607. 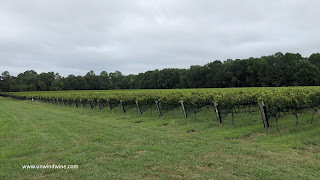 After exploring several sites along the mouth of the Chesapeake Bay, the colonists, fearing pirates and Spanish competition, decided to explore further inland and settled on the site where The Williamsburg Winery now stands. 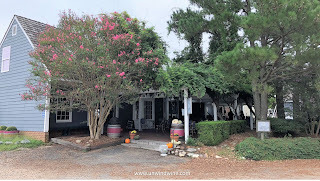 There is also Cafe Provencal, (left) a fine dining bistro restaurant founded by Wessex Hundred Founder Patrick Duffeler, which brings the style and culture he experienced from extensive travels in the South of France, to showcase the output of Virginia farms, and those in surrounding states, and the fruits of the vines to create a true farm-to-farm dining experience. 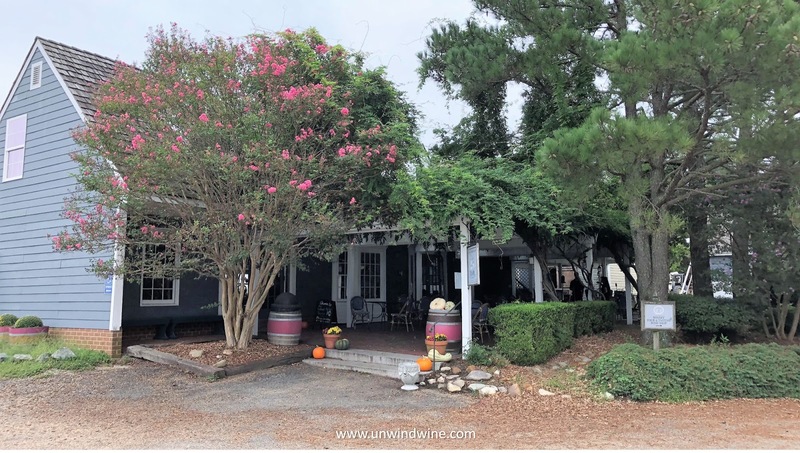 The Williamsburg hospitality center has a tasting room that offers two tasting flights, a standard selection of five different wines, and a 'Reserve' flight offering one's choice of seven different wines. We chose the 'Reserve' flight and selected the five 'big reds' along with one white, their Estate Grown Chardonnay, and one dessert wine, a White Muscato and Vidal Blanc blend. 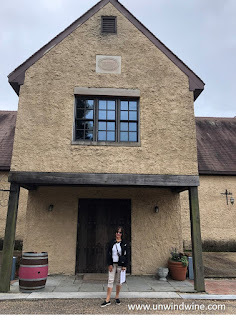 All in all, the whole experience including the wines exceeded my expectations. This is a serious operation that sets high standards for fine wine and earnestly strives to produce a range from good value, high value QPR entry level every day wines, up to premium priced fine wines. 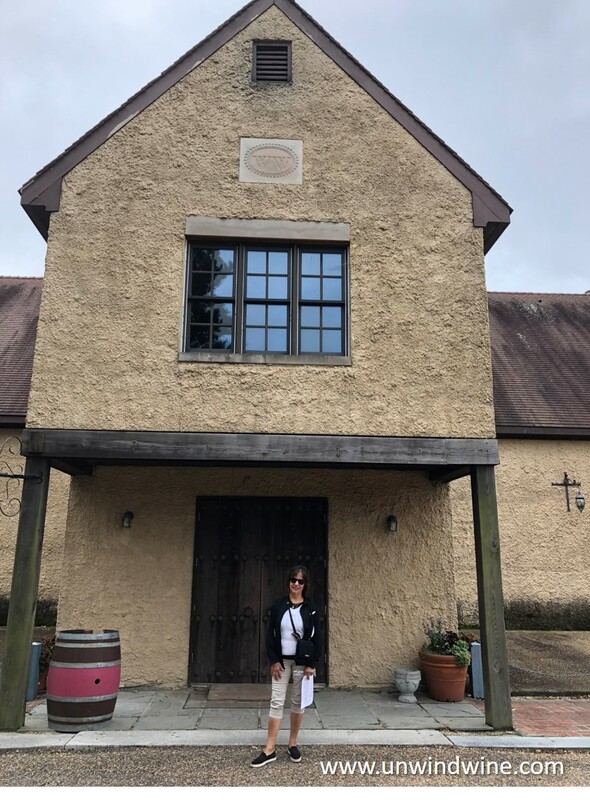 At the high end, they lack the fruit driven richness and fullness of California or Washington State or French wines, and frankly make the Washington Columbia Valley wines from our recent trip, our Seattle Culinary and Washington Wine Tour, out there look really good, with great value. 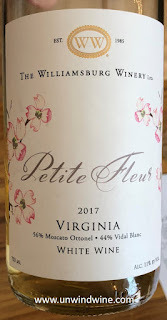 Never-the-less, this probably represents the best of Virginia wines, certainly from our limited exposure, and offers a wide range of options from the casual sipper to collector selections. The servers in the tasting room were knowledgeable and could speak to each wine and its sources, compositions and style. Estate wines are those where at least 75% of the grapes in the bottle are grown on the property of the producer. They carry on the label the appellation or AVA, the American Viticultural Area in which the vineyards lie. Wines that are not appellation specific will carry the name of the larger designation region in which the grapes are grown. Wines that are a blend of grapes from a broader region will carry a broader designation accordingly. This is the first wine I have recall ever seeing that designates American as the designation of the source of the grapes. This is 100% Cabernet Sauvignon sourced from the Lodi AVA in the Central Valley of California about seventy miles east of Napa Valley. This is a simple easy drinking every day wine, garnet colored but light-medium bodied with black raspberry fruits accented by bright acidity, notes of mocha, earthy floral and hints of vanilla. Its not sophisticated or complex but then it is under $15 thereby a reasonable value QPR wine at this sub-$15 price point. This is a blend of Bordeaux varietals: 37% Petit Verdot, 32% Cabernet Sauvignon, and 31% Cabernet Franc. 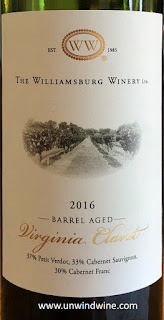 Following the discussion above about specificity of the geography from which the grapes are sourced, this label is designated 'Virginia' Claret. 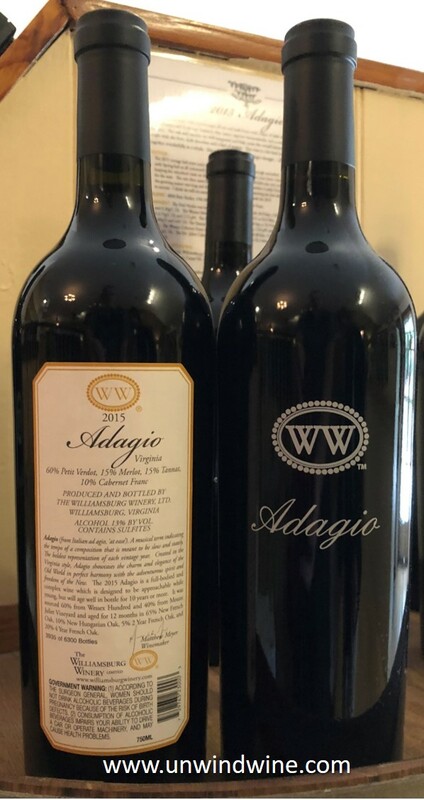 It is a blend of Bordeaux varietals sourced from different sites across the State of Virginia. 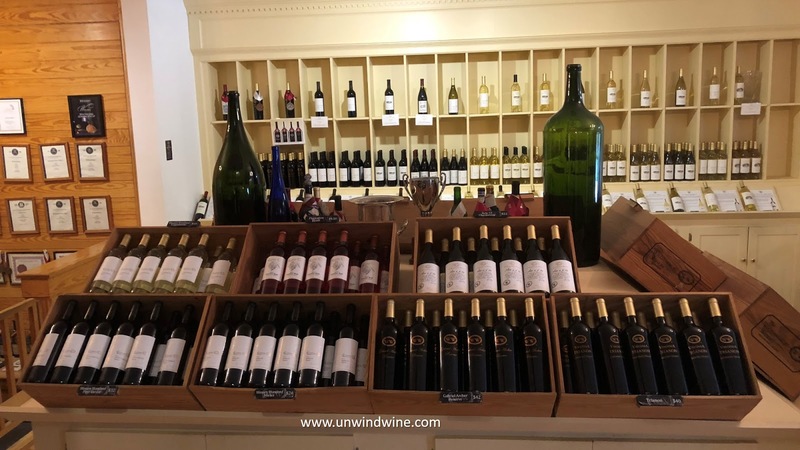 The notation on the promotions for the wine cite it is "Made from a combination of grapes sourced from Wessex Hundred and from our partner growers from around the commonwealth." We're told the Cabernet Sauvignon is grown in northern and central Virginia while the other varietals, Petit Verdot and Cabernet Franc are sourced on the Estate. This is a lighter more opaque ruby colored wine with raspberry, and cherry fruits with notes of black olives, soy, tea and hints of vanilla and oak with moderate soft tannins on the lingering finish. This is another Bordeaux varietal: 100% Petit Verdot, a vineyard designated label, Estate grown fruit from the property. Bordeaux producers use Petit Verdot to add structure and color to their wines and this certainly exhibits those qualities of the varietal. This is dark inky blackish purple garnet colored, full bodied, firm structured with bright expressive black berry and black raspberry tones accented by dark coffee, earth and hints of cocoa, cola, leather and fig with whisper of charcoal turning to pronounced cloying but approachable smooth tannins and tones of oak on the lingering finish. This could well be WW's best wine, or their best quality value wine. In any event, it is likely the best expression of the terrior or fruits produced on the estate. This was Linda's favorite of the flight of wines. This wine is named for the historic Founder of the property, and is only produced in the finest vintages. 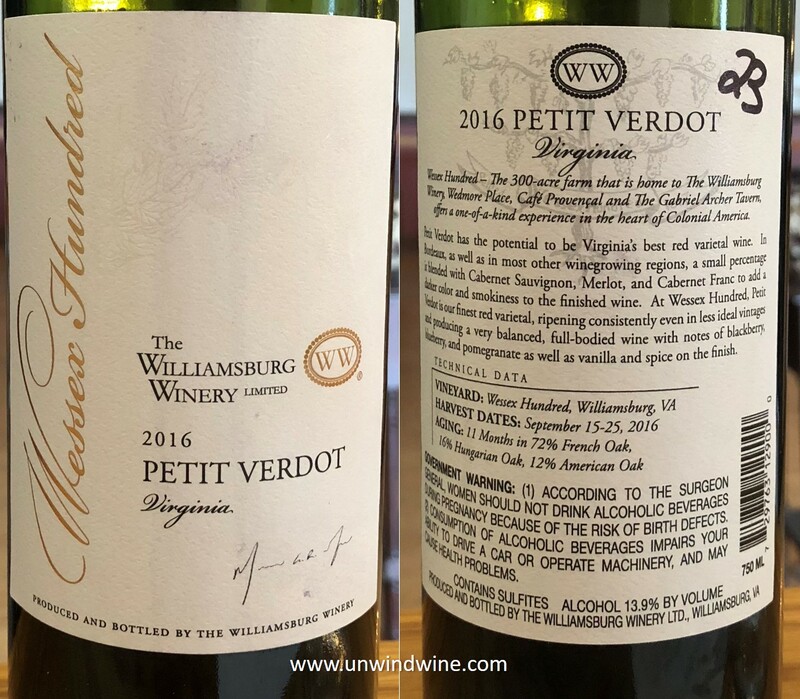 The Reserve wines represents the signature style of the Williamsburg winemaker. 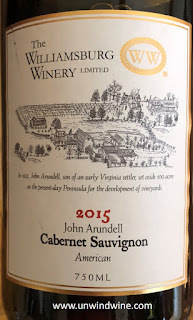 The Cabernet Sauvignon is sourced from the Crozet vineyards in the center of the state while the rest of the fruit is Estate grown on the property. This is a blend of traditional Bordeaux varietals: 36% Cabernet Franc, 25% Merlot, 20% Cabernet Sauvignon, 12% Petit Verdot and 7% Malbec. Dark garnet colored, medium full bodied, black berryand black cherry fruits are accented by notes of cassis, mushroom and hint of eucalyptus with earthy leather and herbs turning to hints of oak. 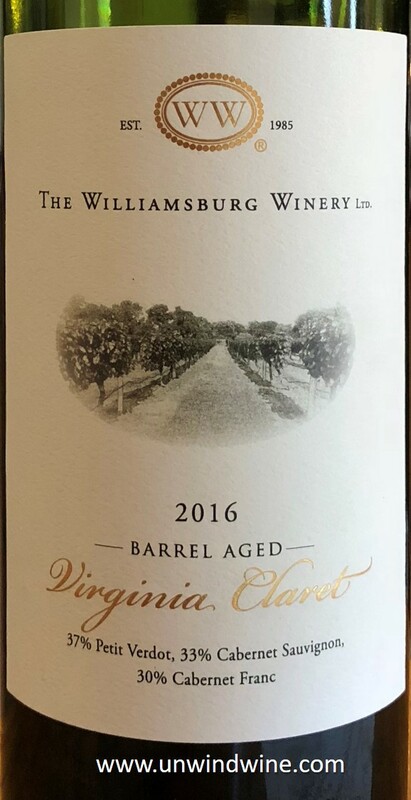 This is the flagship wine of Williamsburg Winery, a blend of Petit Verdot (58%), Merlot (15%), Tannat (15%), and Cabernet Franc (12%). It is packaged in a large heavy oversize bottle with a very large bung, with painted labeling on the front, with a traditional paper label affixed to the rear. It is priced at a premium price-point of $75 per bottle. 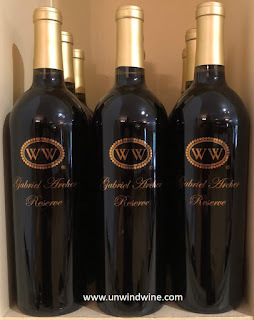 This was dark garnet colored, medium full bodied, complex black berry fruits with notes of vegetable, wood and charcoal, tones of dark chocolate mocha and hints of menthol camphor and floral turning to cloying tannins on the lingering finish. RM 90 points. 90 + points - Robert Parker's The Wine Advocate (August 2017). This is a blend of two white varietals: 56% Muscat Ottonel and 44% Vidal Blanc. 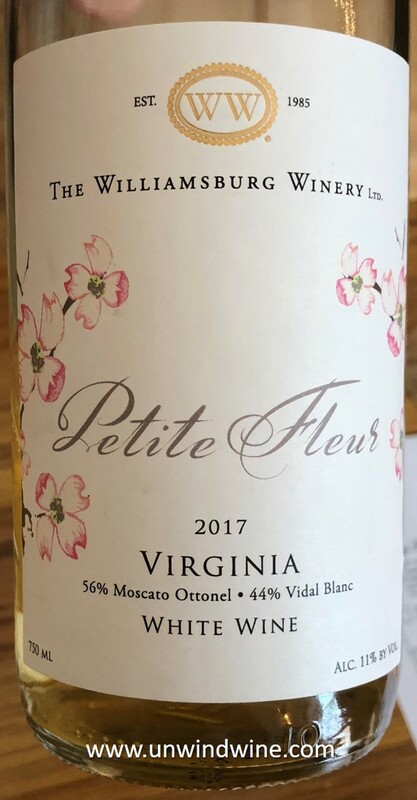 The Muscat Ottonel is sourced from partner producer growers in Charlottesville, VA; the Vidal Blanc is sourced from the Wessex Hundred Vineyard on the Estate in Williamsburg, VA. 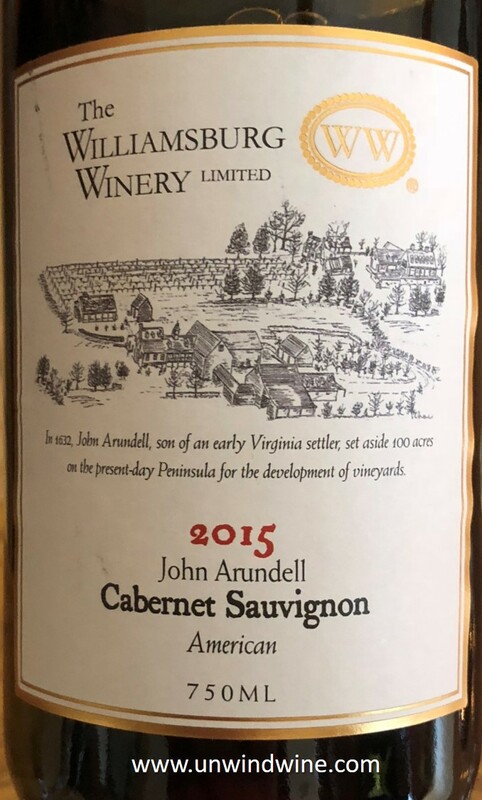 This is another wine designated as a 'Virginia' wine. 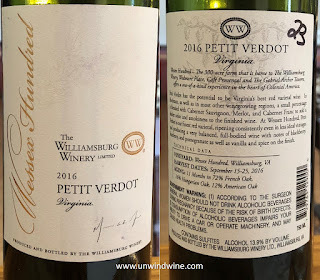 This was an interesting, pleasant drinking wine, nicely balanced, straw colored, medium light bodied, white peach flavors with notes of apricot and pear accented by tropical fruits, with notes of vanilla on a nice acidic viscous finish.